My 6 year old son and I were given the opportunity by Timberdoodle to use and review Daily Word Problems Grade 1 Math. This was particularly exciting for my 6 year old because he LOVES math. 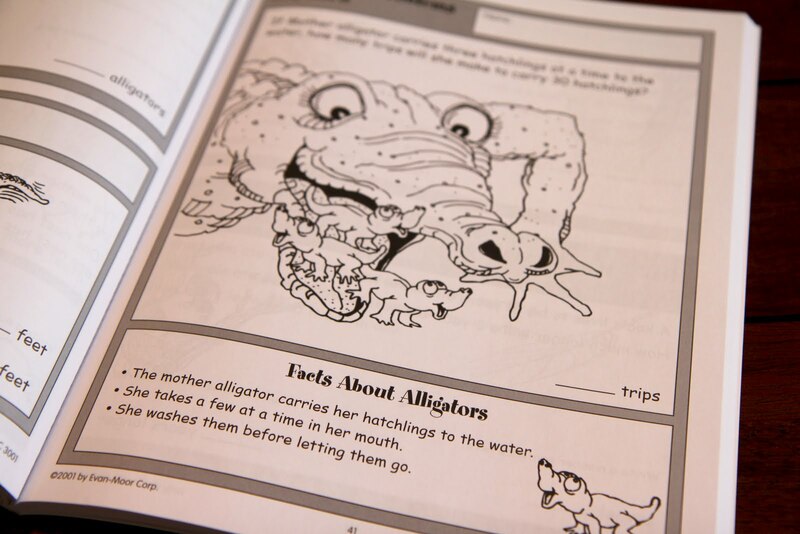 The workbook is 110 pages of various math word problems. Addition, subtraction, graphs, simple charts, reading and writing number and words, counting by 2's, 5's and 10's, fractions, time, money, measuring and cute illustrations to go along with the word problems. It has everything. There are even facts about the animals in the word problems. The content of this workbook is thought provoking, stimulating, but not too difficult while still being challenging. There are some illustrated visual aids for children who may need them. My 6 year old is very much a child who can do math problems, even multi-step problem in his head, but my older son is more of a visual learner, so I do like them being there. 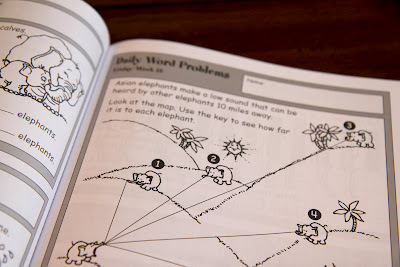 My son found Daily Word Problems Grade 1 Math to be fun to do and it wasn't frustrating on my end because the questions are worded in a way he could understand them and understand what he needed to do to solve them. I personally like the entertaining illustrations. They add a little something to the questions and I do not find them to be distracting. I think they make the book a little more fun! I also love the addition of the facts about the animals as does my son. It's just that little extra bit for an eager learner, especially one who loves animals. 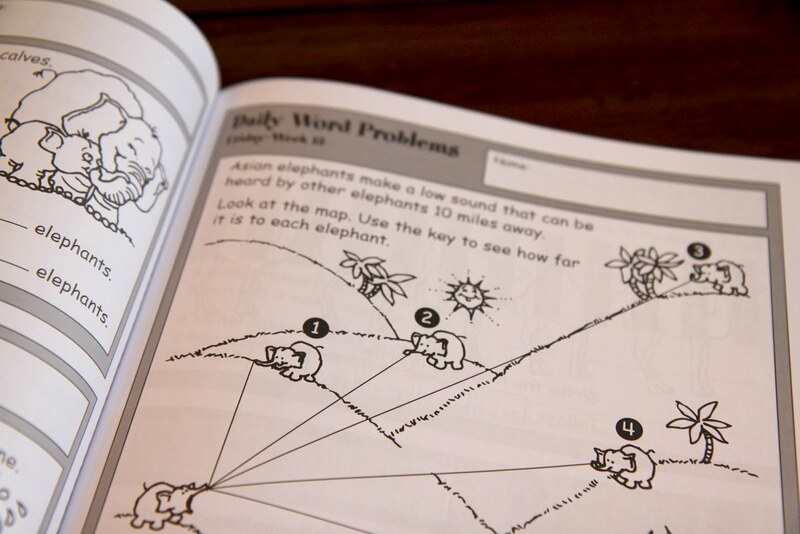 Daily Word Problems Grade 1 Math is a workbook I'll be glad to purchase and use again for my younger children. I don't really have anything negative to say about the book. We are really happy with it overall. Daily Word Problems Grade 1 Math is incorporated in Timberdoodle's 1'st Grade Complete Curriculum Package as well as available for purchase by itself. This workbook as well as hands on kits, educational games and a whole large selection of other educational materials and curriculum are available on the Timberdoodle website or in their Free Catalog. 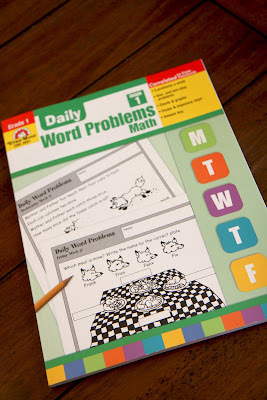 As a member of Timberdoodle's Blogger Review Team I received a free copy of Daily Word Problems Grade 1 Math in exchange for a frank and unbiased review. This Little Quiz Was Pretty Much Spot On!